(CNN) - His name causes shivers in many Democratic circles, but Ralph Nader said Thursday his campaign history won't prevent him from another foray into national politics. Nader, a persona non grata to many Democrats after he ran as a third-party candidate against Al Gore and George W. Bush in 2000, explained on CNN why he was recruiting potential candidates to run against Pres. Barack Obama in a Democratic primary. 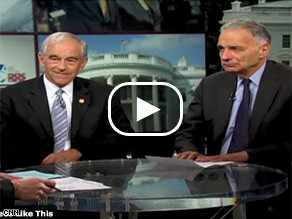 Watch Paul and Nader sound off on the two-party system. (CNN) - Watch Rep. Ron Paul and Ralph Nader as they discuss what they think is wrong with the two-party political system and why they think third parties should get more attention in political dialogue. Nader is taking heat for his latest comments. (CNN) - Ralph Nader's presidential candidacy has received little media attention, but his latest critique of Barack Obama has come under fire for it's seemingly racial overtones. Speaking with Colorado's Rocky Mountain News, Nader accused Obama of attempting to both "talk white" and appeal to "white guilt" in his quest to win the White House. "There's only one thing different about Barack Obama when it comes to being a Democratic presidential candidate. He's half African-American," Nader told the paper in comments published Tuesday. "Whether that will make any difference, I don't know. I haven't heard him have a strong crackdown on economic exploitation in the ghettos. Payday loans, predatory lending, asbestos, lead. What's keeping him from doing that? Is it because he wants to talk white? He doesn't want to appear like Jesse Jackson? We'll see all that play out in the next few months and if he gets elected afterwards." Obama's presidential campaign called those comments disappointing, and his communication's director, Robert Gibbs, said Tuesday they were "reprehensible and basically delusional." "I don't think he's spent a lot of time looking at the record of Barack Obama," Gibbs said on MSNBC. 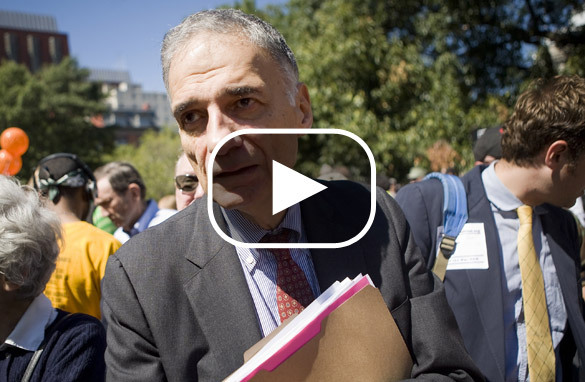 Nader, the longtime consumer advocate who was blamed by many Democrats for Al Gore’s loss in the 2000 presidential election, said Obama's top issue should be poverty in America, given his racial heritage. Blitzer: Can a third party candidate break through? What impact will Nader and Barr have this election season? (CNN) - There are two intriguing third party candidates running for president his year: Ralph Nader and Bob Barr. Both are well known here in Washington. But will they have an impact around the country if the election between Barack Obama and John McCain is close? Nader, a long time populist and liberal consumer advocate, has been here before. He won more than 90,000 votes in the Florida election in 2000 and was widely accused of helping George W. Bush beat Al Gore by just more than 500 votes in the state. Gore’s supporters believe that he would have won the state and the election if Nader had stayed out. 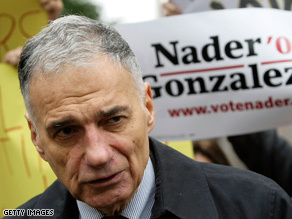 Nader denies that, insisting he took votes from both Democrats and Republicans. Barr is a former Republican Congressman from Georgia and is now running on the Libertarian Party ticket. In the House of Representatives, he was always an outspoken conservative. He took the lead in initiating impeachment charges against President Bill Clinton. Given that conservative track record, he is likely to take votes away from McCain, especially in Georgia where he is relatively well-known. Obama’s supporters are hoping he does. They believe Georgia is fertile ground for the Democratic candidate, especially if the Democrats can register hundreds of thousands of new young and African American voters in the state. So let’s see how Nader and Barr do this time around. (CNN) – Ralph Nader, who recently announced his own 2008 presidential bid, has now also weighed in on the battle between Sens. Hillary Clinton and Barack Obama. In a blog posting on his campaign’s website, Nader advised Clinton to stay in the Democratic nomination race, despite recent calls for her to drop out from high-ranking members of the Democratic Party who back Obama. “Just like every other citizen, you have the right to run. Whenever you like. For as long as you like,” wrote Nader. Sen. Patrick Leahy of Vermont and Sen. Chris Dodd of Connecticut, both of whom support Obama, made comments Friday that are some of the strongest yet from prominent Democrats suggesting that Clinton reconsider her presidential run. Clinton has showed no signs of dropping out of the race. She currently leads polls in Pennsylvania, the next state to hold a primary. But, Obama was endorsed Friday by Pennsylvania Sen. Bob Casey, Jr. and the endorsement may help Obama with Catholic voters, an important demographic in Pennsylvania which has favored Clinton in other states’ primaries. 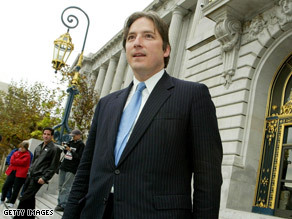 Matt Gonzalez ran for mayor of San Francisco in 2003. (CNN) - Ralph Nader has selected a former San Francisco city official as his running mate in the presidential race. Nader announced his selection of Matt Gonzalez, who served as a public defender and a member of the board of supervisors in San Francisco, at a news conference Wednesday. "It is an honor to run with Mr. Nader," Gonzalez said. "I hold him in high esteem and share his politics." Gonzalez said his priorities in the campaign are election reform, poverty and the war in Iraq. "I find Matt Gonzalez unwavering in his principles," Nader said. He announced Sunday that he will launch his fourth consecutive White House bid - fifth if his 1992 write-in campaign is included. Many Democrats fear Nader could draw votes from whoever gets the party's nomination, potentially helping presumptive Republican nominee Sen. John McCain win the White House in November. Nader has long rejected accusations that he served as a spoiler in 2000, in effect helping George W. Bush beat out Al Gore. Will he have an impact? Watch Nader on CNN's American Morning Monday. WASHINGTON (CNN) - Facing criticism from the two Democratic presidential contenders, Ralph Nader lashed out at them Monday and defended his decision to enter the race. Speaking to CNN's "American Morning," the long-time consumer advocate accused Sen. Barack Obama of "name-calling" and "an unseemly silence" on issues involving poor minorities. And he accused Sen. Hillary Clinton of being too close to "big business" in America. Many Democrats fear Nader could draw votes from whoever gets the party's nomination, potentially helping presumptive Republican nominee Sen. John McCain win the White House in November. Nader has long rejected accusations that he served as a spoiler in 2000, effectively helping George W. Bush beat out Al Gore. On Saturday, Obama was asked about a possible Nader candidacy. He praised Nader's work for consumers, but added, "My sense is that Mr. Nader is somebody who, if you don't listen and adopt all of his policies, thinks you're not substantive. He seems to have a pretty high opinion of his own work." Nader responded in Monday's interview. "As if Barack Obama doesn't have a high opinion of his own work? That's name-calling. "Address the issues, Barack. Address why you're not for single-payer health insurance... Explain why you don't challenge what you know as to be tens of billions of dollars of waste, fraud and abuse in the military budget. 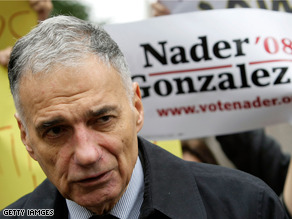 Nader said Sunday he will mount another presidential run. 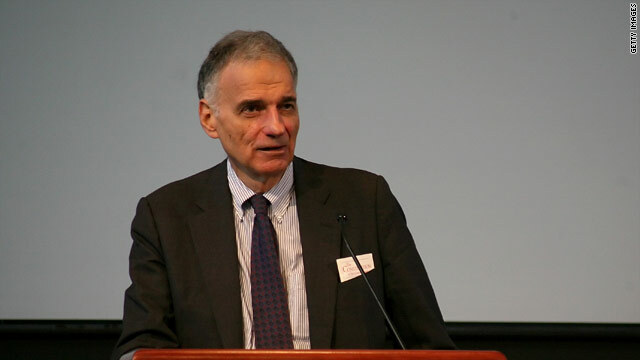 WASHINGTON (CNN) - Ralph Nader announced Sunday he is entering the presidential race as an Independent. In an interview with NBC's "Meet the Press," the consumer advocate said great changes in U.S. history have come "through little parties that never won any national election." "Dissent is the mother of ascent," he said. "And in that context I've decided to run for president." Nader, who turns 74 this week, complained of the "paralysis of the government," which he said is under the control of corporate executives and lobbyists. It marks his fourth straight White House bid - fifth if his 1992 write-in campaign is included. 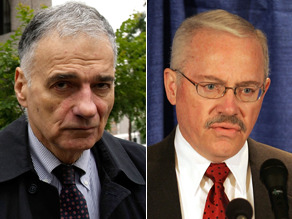 Nader's entry into the race did not come as a surprise to political watchers. On Sunday, Sen. Barack Obama criticized him. "My sense is that Mr. Nader is somebody who, if you don't listen and adopt all of his policies, thinks you're not substantive," Obama told reporters when asked about Nader's possible candidacy.